So the team news is out, and Liverpool boss Brendan Rodgers has opted to start the same XI he played against Stoke last week. Let's look at Rodgers' selection then: Simon Mignolet, of course, starts in goal while Nathaniel Clyne takes the right-back spot alongside the centre-back pairing of Dejan Lovren and Martin Skrtel while Joe Gomez is at left-back. No real surprises here as Rodgers opted to start Lovren ahead of Mamadou Sakho last week and was rewarded with an improved performance against Stoke. Gomez also impressed last week and starts tonight against Bournemouth. In midfield, Rodgers has stuck with Jordan Henderson and James Milner while goalscorer Philippe Coutinho is also included. 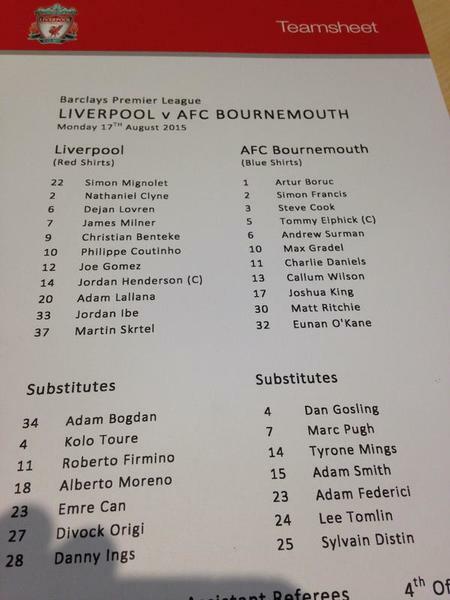 Interestingly, the Liverpool boss has decided to keep Adam Lallana and Jordon Ibe on the flanks with Christian Benteke up front, with Lallana in particular failing to impress last week.
.@afcbournemouth team v @LFC - Boruc, Francis, Elphick, Cook, Daniels, Ritchie, O'Kane, Surman, Gradel, King, Wilson. 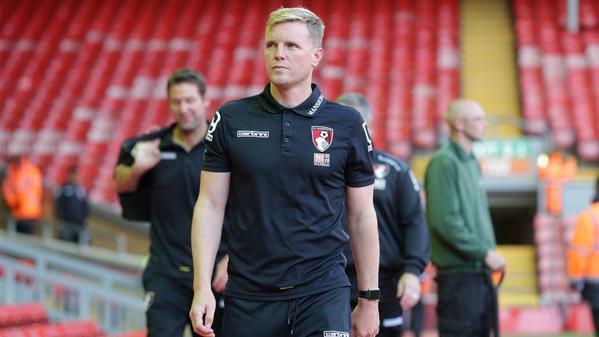 So Eddie Howe has chosen to go with a 4-4-2 formation against Liverpool tonight with Artur Boruc in goal, Simon Francis at right-back, Bournemouth's familiar centre-back pairing of Tommy Elphick and Steve Cook and Charlie Daniels at left-back. In midfield, Matt Ritchie and summer signing from Saint-Etienne, Max Gradel, will try and use their pace to cause Liverpool problems on the flanks while Eunan O'Kane and Andrew Surman protect the back four. Up front are Callum Wilson and Joshua King. So those are the teams - but what are the key stats and facts you need to know about this game? 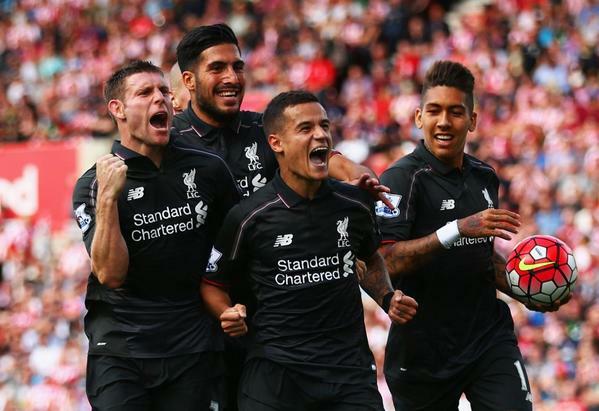 Liverpool come into their first home game of the new season tonight following a 1-0 win over Stoke City last weekend. 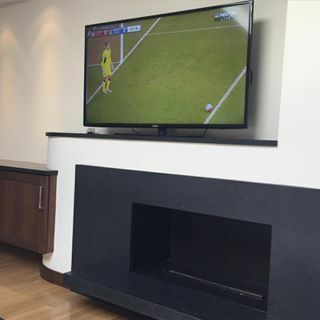 Of course, Coutinho was the difference in that match with his stunning long-range goal four minutes from time. The Brazilian has been rightly praised for his goal, but was still omitted from his nation's squad for their upcoming fixtures - which Rodgers admitted had surprised him. Rodgers will probably be hoping Coutinho has another good game tonight and scores another stunning goal which, according to Henderson, the Brazilian does regularly during training. Three of Coutinho's four goals in 2015 have come from outside the area. Rodgers will also be hoping to see Liverpool's summer signing Benteke have a greater impact tonight after the striker only touched the ball just five times in the penalty area last week. Moving onto Bournemouth, this is the their first trip to Anfield in 47 years. The Cherries may not have played a league game against Liverpool before but they did twice host the Reds in previous seasons - narrowly losing both games. Bournemouth manager Howe spoke of his admiration for Rodgers' style of play this week, but admitted his side would do what was needed to win at Anfield tonight. Let's see if they can indeed do that. We are just minutes away from kick-off at Anfield! 2mins: Both teams have enjoyed some early possession in the opening minutes but it's Bournemouth who have the first corner of the match but Liverpool are able to clear. 4mins: Now the home side have a corner after Lallana's ball to Benteke results in the striker going for goal. Ibe strikes the ball first time, but it goes wide. 5mins: Close! Bournemouth take a corner kick and Elphick out-jumps Lovren to head the ball past Mignolet - but the goal is ruled out. It seems it may have been disallowed because Elphick pushed Lovren downwards as he tried to gain the height to head the ball towards goal. 8mins: The visitors are enjoying a good start to the game and are pressurising the hosts in the attacking third. 9mins: Liverpool are having to defend here as Gradel links up with his fellow midfielders to push the ball forwards. 10mins: Gradel takes a free-kick but whips the ball well wide. 11mins: Liverpool go on the attack after Coutinho gains possession, passes to Ibe, then plays a one-two with the full-back but his resulting shot doesn't trouble Boruc. 14mins: Bournemouth are really defending well here as Liverpool try and build-up an effective attack but are failing to find a way through. 16mins: Coutinho latches onto Milner's pass in midfield before delivering a lofty pass over Bournemouth's defence and into the path of Benteke, who just can't get his foot onto it in time. 19mins: Coutinho again involved in another of Liverpool's moves forwards with an accurate pass to Ibe, but the winger can't run onto his pass in time and it goes out of play. 21mins: Wilson gets the ball on the edge of the box and, after some fancy footwork, drives a low cross to King but it comes to nothing. 22mins: Corner kick to Liverpool - but the visitors deal with it comfortably. 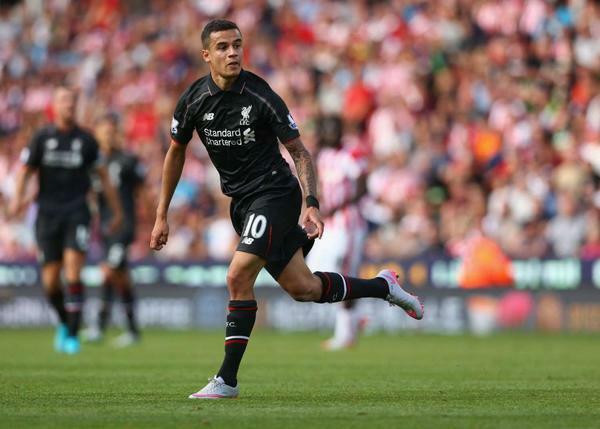 23mins: Coutinho appears annoyed and is shaking his head after giving away a free-kick. 24mins: And Liverpool have one of their first real shots at goal after Francis' clearance back towards his own goal finds Benteke. The striker drives his long-range effort over the crossbar. 25mins: GOAL! 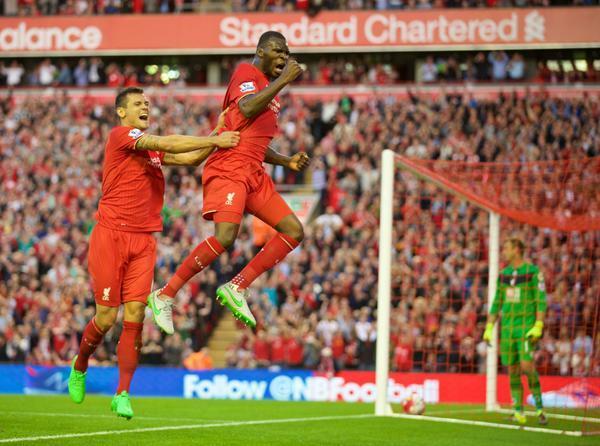 And it's Benteke who has given Liverpool the lead - on his home debut too. The move that led to the goal started from Henderson's deep cross, which Coutinho couldn't get his foot to but Benteke was waiting just behind the Brazilian and poked in from close range. That's Benteke's first goal for his new club and his 50th in English football. 29mins: Close! Liverpool nearly double their lead through Henderon's shot from range which grazes the crossbar. 50 - Christian Benteke's goal was his 50th in all competitions for English clubs. Poach. There will be some debate about Benteke's goal, though, as the new offside rule means a goal can be disallowed if a player - in this case Coutinho - makes a play for the ball even if they don't touch it. More on the rule changes, here. 34mins: O'Kane gets a yellow card for bringing down Coutinho as the Brazilian made a run from midfield. Liverpool get a corner kick, which Henderson takes, but Ritchie heads the ball clear.